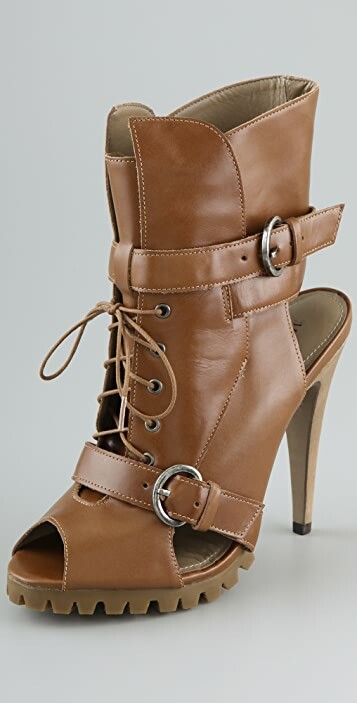 These lace-up, open-toe leather booties feature side and heel cutouts. 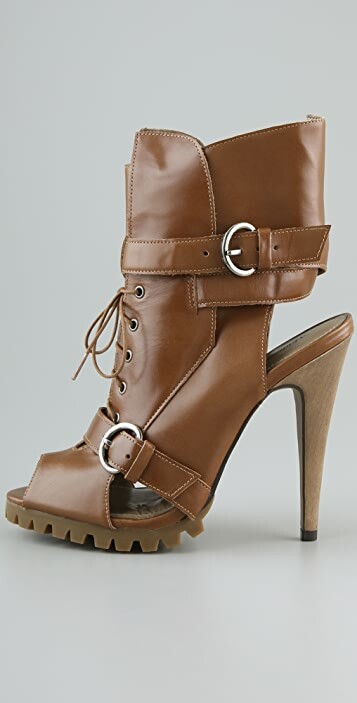 Buckled strap at vamp and wraparound buckled strap at split shaft. Distressed stiletto heel and lug sole. Named after the streets on which the designers grew up, Madison Harding was launched by college friends Hilary Rosenman and Barri Budin. The duo quickly formed a friendship when they discovered a mutual passion for vintage fashion, contemporary design, and art, three factors that play a role in each shoe they design. Madison Harding shoes are vintage inspiration with a nod to current trends, and they are what every style-conscious girl dreams of. 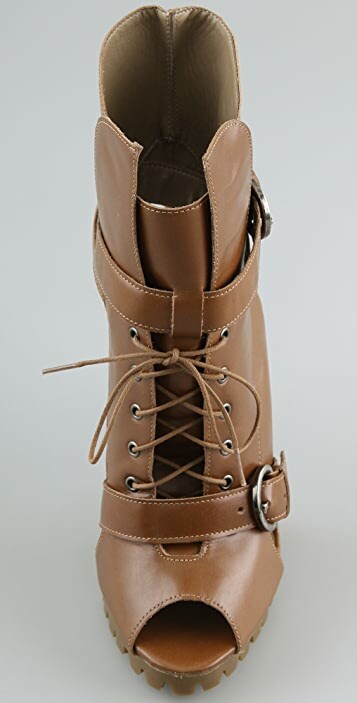 Looks very nice and Im glad the straps are adjustable Boot openning is abit big for me though it should be fine once i wear skinnies happy with the purchase ! Love the shoe, true to size fitting and looks great! Love these. They go up past the ankle and the leather is supple. The ankle buckle is the only closure you'll need to access to put the shoe on and take it off. Wish it was cut a bit narrower at the ankle wrap but I have bizarrely skinny ankles so most shoes gape a bit anyway. I normally wear a 37.5 or 38 and this 38 fit perfectly. Heel is really high but the ankle support and thick rubber sole makes it more comfortable to wear. Comfortable pair of shoes, exactly as described and expected. what you expect for a $100. At this price I'm not disappointed. If I paid $300, I would send them back. Pros...they are size adjustable with the straps, like the style, and they have great treads for ice and snow. Cons..the leather, heel and hardware seems cheaper quality.